This wasn't the outfit I had planned to wear on Monday. As I was working from home I was going to just wear a simple dress, this French Connection one. I last wore it when I was still hiding the tiny baby bump, using the tie waist and print to disguise it. Baby is much bigger now, and as a result the dress is much too short, haha! Ended up in my default singlet and maxi skirt outfit instead. This singlet is one I bought in the last Jeanswest sale a couple of weeks ago, only getting around to wearing it now. Last worn: Ray Ban Wayfarers, stripe maxi skirt, Havaianas, Rebecca Minkoff silver mini MAC. First time I've worn the tank as it's a recent purchase. Haven't worn this dress for a while! Found it in my wardrobe when I was hunting for a nice easy dress to wear to work today. Thankfully it was not too short with the baby bump, haha! 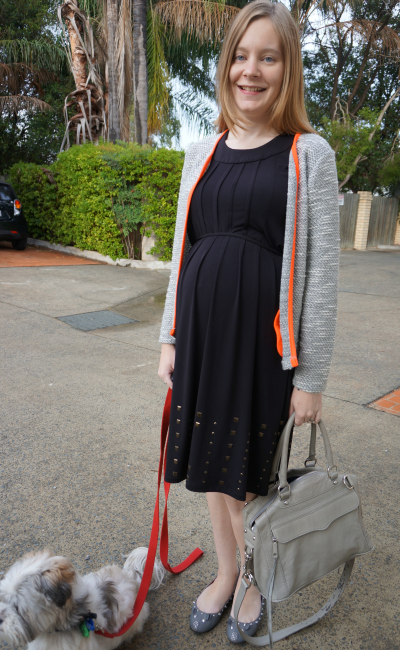 Pleased to still be getting use out of my regular wardrobe in the third trimester, and hoping it continues. As it was a little cooler with the rain, added the cardigan to keep warm. I think the neon orange was nice against the black dress too :) Please excuse the water droplets on the MAM - they dried up fine, but I brushed against a tree on my way to take photos and my bag got a little wet. Last worn: Asos boucle blazer, studded black dress, MbMJ studded mouse flats, Rebecca Minkoff MAM. Linking up with Style Sessions, Trend Spin Linkup, What I Wore Wednesday, Real Mom Style, Personal Style Monday, Spotlight Weekly today. Beautiful :) ,love the mini Bag! You are so cute while pregnant! I hope I am like this one day, I love it! I love your four-legged modeling companion! Too cute. your asos blazer is beautiful! i agree -- the neon orange looks fantastic with black! So cute! 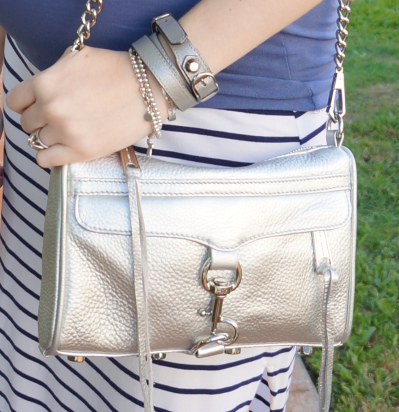 I'm loving that striped maxi and that silver bag is seriously gorgeous! Great look! That black dress is lovely on you, Mica! How perfect is your bump! It makes me broody! You are so cute in stripes! 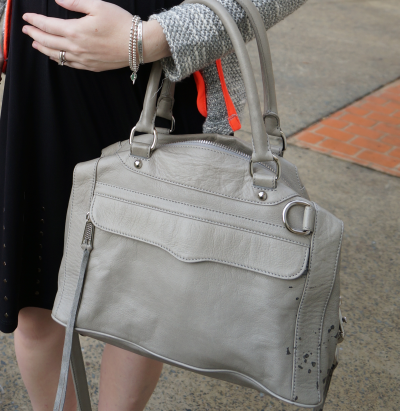 And Rebecca Minkoff is one of my go-to's when I'm craving a new bag- hers are some of the best! Love the black dress and blue look great on you also! i love that blue on you. looks so good mica. the hem details on that black dress are pretty. you look so good. The 2nd black dress is absolutely stunning on you! Oh definitely, target has some great basics! :) Even better when there is a sale on too ;) I'm due in June, not long to go now! I like that long skirt! love the second outfit!!! the dress is lovely on you! Oooh that black dress is absolutely pretty! I love how you paired it with that cardigan - so cute! Oh I just love that black dress. The lines are such a great detail! i'm in love with the ASOS boucle blazer! Rocking the blue with the nautical stripes! Your black dress is working really nicely with the baby bump too. Best wishes! Ooooh, love that first outfit a lot, it's so nautical and cute! I love that textured blazer with the black dress on you! You're definitely going to be a stylish mum. You can't hide the bump now! How exciting. Love the dress, it suits you perfectly. So gorgeous as always! Love both of those bags!! Beautiful! I love that second outfit! The pipping on the sweater is so fun! It looks perfect with the dress and shoes! Jealous you have flip flop weather! Oh my goodness, you look amazing!! Oooh! Love that metallic mini! And I feel like your bump has grown overnight! (in a good, adorable way!) So excited to see you through this journey! Oh and I want that Asos blazer, now thats on sale, maybe it will happen.